Sterling Silver 5.5x10.9mm Teardrop Bezel Charm with 4.5x7mm Pale Aquamarine Natural Stone, 1.5mm Closed Ring ID. Facet cut stone has a pointed culet at the back for maximum light refraction. But, the high bezel walls enclose the entire depth of the stone so the culet does not protrude from the back of the setting. Aqua. Water. Cool. Blue. Refreshing. Life-Giving. What would we do without it? 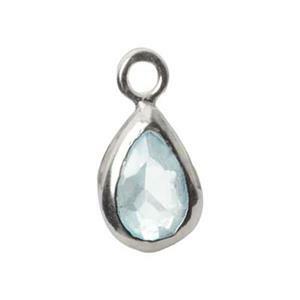 Our SK469 – Bright Sterling Silver Teardrop Bezel Charm with Aquamarine Gemstone. Just what your Earring Designs are Thirsting for! Dangle from one of our many Sterling Earring Findings. Notes: Brite finish, approximate thickness - 3.3mm. Translucent aqua blue. Color will vary.